Last weekend, DC hosted the USA Science and Engineering Festival. This was the fifth biennial event, which started life in 2010 as an overgrown science fair spread across the National Mall and Pennsylvania Avenue. I have a few images on Flickr from that year, as well as from 2012 and 2016. Not sure why I missed 2014. Unfortunately the Festival has turned into a commercial showcase dominated by government contractors, federal agencies, and the military. 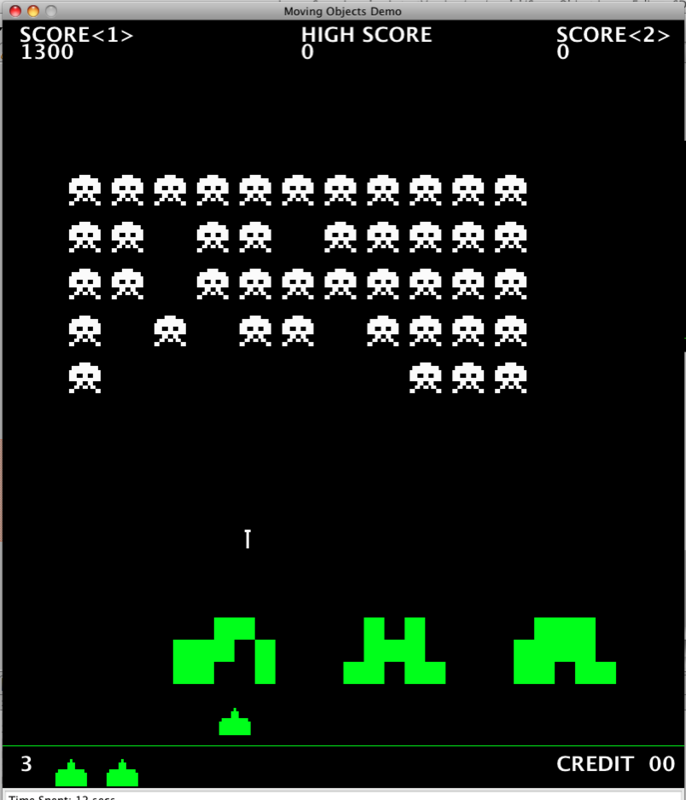 And, of course, everyone was into STEM. Sorry, arts people. I only saw one reference to STEAM. Even with the excessive weaponization of science, there were some interesting exhibits and fun sights mixed in. Here are a few images from my time in the two huge halls, with the full gallery here. 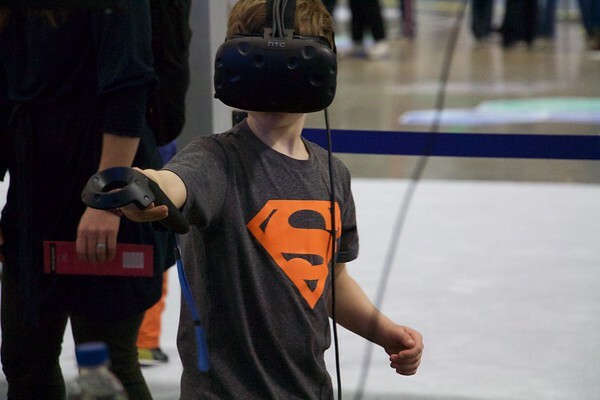 Many exhibits featured VR and this young man seemed to be having a good time with whatever was in this world presented by the US Air Force. 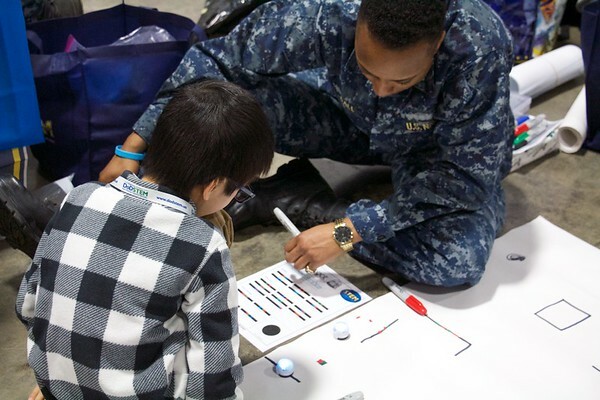 A cadet from the US Naval Academy helps this boy with programming an Ozobot. 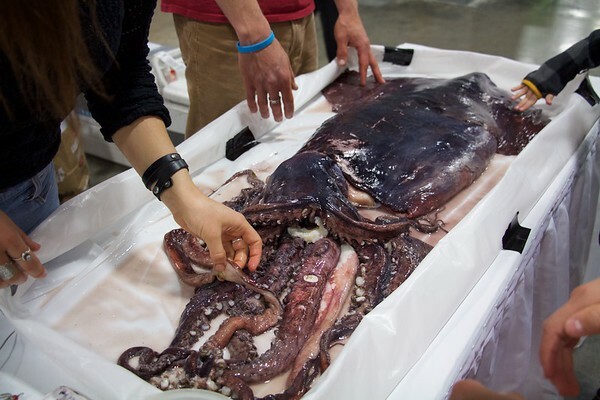 An organization called Squid4Kids based at Stanford University brought, what else, a squid for all of us to touch. It’s just as slimy as it looks. 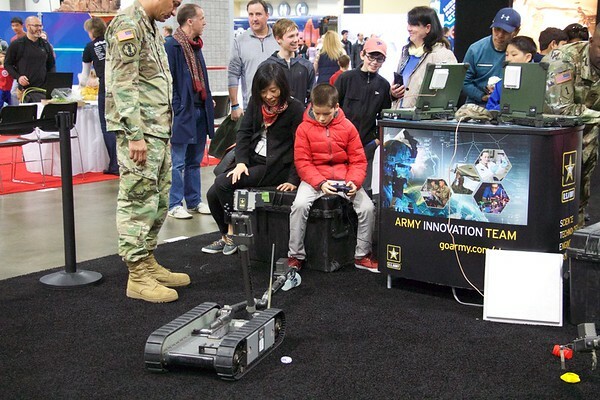 And at the Army’s huge space, this young man was learning how to drive one of their vehicles using what looked like a standard video game controller. What’s Your Attitude Towards Science? 3M, the US-based conglomerate probably best known for their Post-It notes, recently released a report called the State of Science Index. They call it “one of the largest, most global studies” done in recent years to gain some understanding of the public attitude towards scientists and their work, surveying more than 14,000 people in 14 countries. 87% said that their general attitude towards science was one of fascination, rather than boring. The same percentage thought “the world is a better place today because of science” and were “hopeful” when they heard the word mentioned. 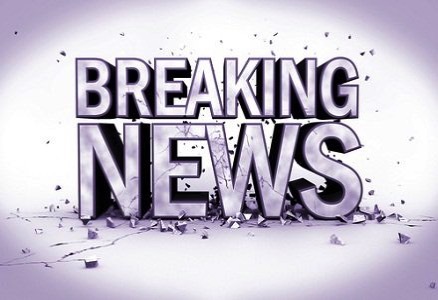 Two-thirds said they were “excited when thinking about the future impact of science on society” and that “science is very important to society in general”. However, when you dig down into the responses, there is much to be worried about. I don’t mind the 32% who said they were “skeptical” of science. Questioning claims made in scientific reports is a healthy approach to understanding complex ideas. Especially since most people get their science news from a TV news reader who likely doesn’t understand beyond the summary statement in their script. Far more troubling than skeptics is the 27% of respondents who “do not see the point of needing to understand science as adults”. Plus the relatively large percentage of people who agree with statements like “If science didn’t exist, my everyday life would not be all that different.” and who fail to see a link between scientific research and “technology”. In the US, these numbers parallel the around-30% in political poll after poll who refuse to accept basic scientific findings like the existence of climate change as major problem facing society. Or who believe that childhood vaccinations are some kind of conspiracy between doctors and drug companies. These kinds of attitude surveys can be interesting, although they should also be read with some skepticism. But if you teach middle or high school students, you may want to give them the executive summary and ask them to reflect on the findings. How do their attitudes compare to those of the adults in this survey? Of course, the 3M Index is looking at current opinions and only tangentially addresses the state of science education. However, how children are taught science during their years in K12 directly affects their understanding of science as adults. There is a direct link between classroom science instruction that involves memorizing lots of facts and little direct interaction with scientific concepts and the 86% of respondents who say they know “little or nothing” about science. And the large percentage of those people who have no interest in learning more as adults. Unfortunately, we tend to elect far too many of those people to leadership positions. I learned of this survey through a discussion with former astronaut Scott Kelly on Marketplace Tech, a daily podcast about how technology affects our lives. 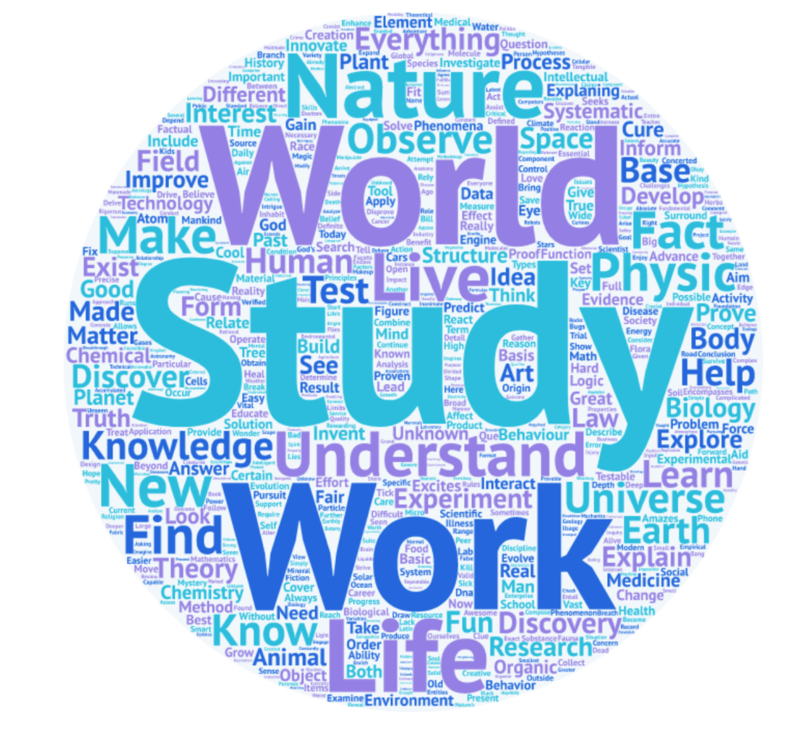 The image is from the executive summary of this report and shows the word cloud created when people were asked to complete this task: “Please fill in what you think science is in no more than two to three sentences. Science is…”. While life continues chaotically forward (sorta) here on Earth, there are still people looking upward and outward for signs of life, intelligent or otherwise. They’re also trying to figure out what we will do when, and they do believe it’s when, not if, a message arrives. Within the International Academy of Astronautics, a group has drawn up the “SETI1Search for Extra-Terrestrial Intelligence post-detection protocol”, a set of guidelines of how scientists should address the issue. Including, how to tell the rest of us. It’s that part that worries them most since any message received is likely not going to come from a spaceship we can see hanging over New York City. Or say something particularly intelligible. I would bet on that “irrationally extreme” reaction from far too many people, especially those currently running the show who wallow in rumor, paranoia, and conspiracy theories. Anyway, I find this aspect of scientific preparation very interesting, even though I only know enough about the science to understand that direct, meaningful contact with another species is extremely unlikely at this point. It’s not that I believe we’re alone in the universe. Only that the universe is a really, really, REALLY big place and all of us are subject to the laws of physics.